New guitar day! This little gem arrived today and I’m knocked out at the huge sound from such a small package. Thank you Todd, I love every thing about it. My photo exactly doesn’t showcase the “in person” beauty of this guitar. If you ever have an opportunity to have a Clinesmith built for you, take it! Ooh la la! I was actually pulling up this thread again the other day just to see if anything new had transpired. 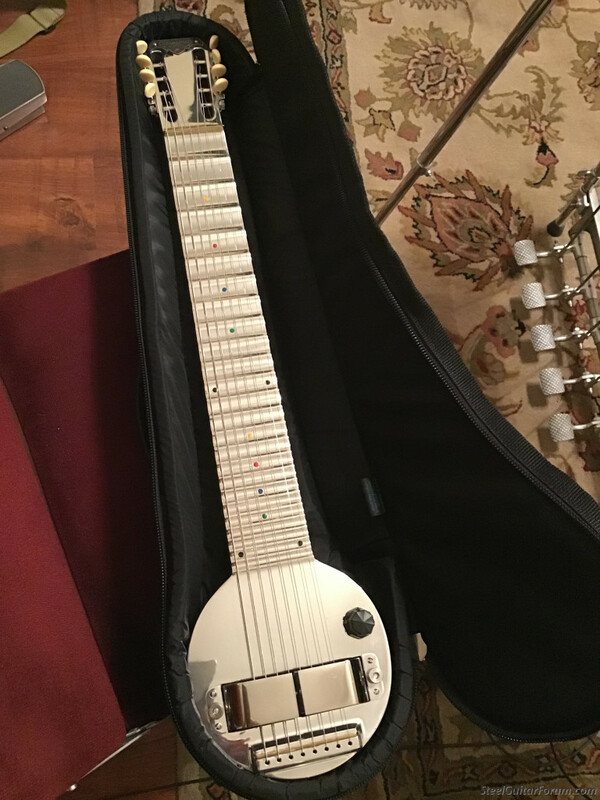 With my current humble stable of steel guitars I feel like I've got most of what I need, but this one sure calls to me! Lucky you, Rick! I had ordered last October, I was told mine would be ready by the mid February. Just can’t wait!! Thanks guys. It’s definitely worth the wait, Hideki. I’m not ordinarily a fan of gig bags, but the Blue Heron custom fitted bag that Todd included with my Frypan, is exceptionally well made. 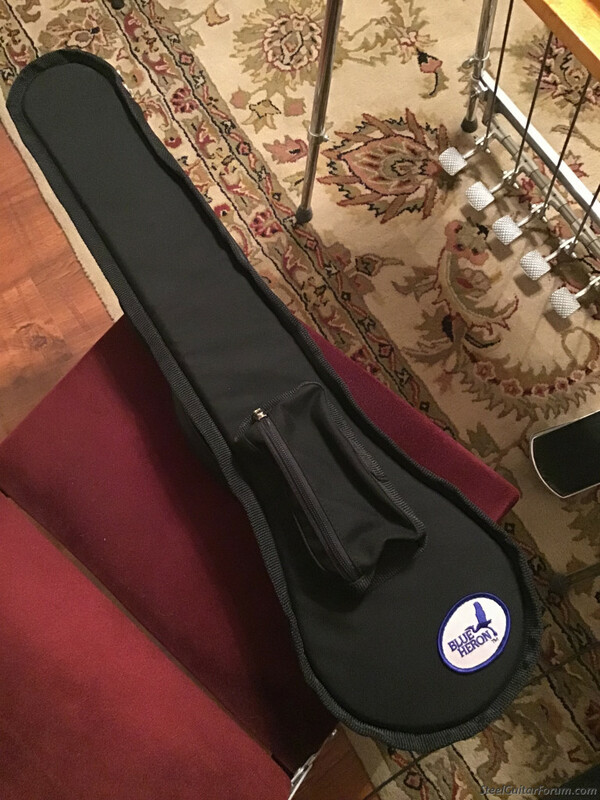 It fits the guitar perfectly and has a heavy duty handle, straps, stitching and zippers. You’re gonna love it. I have the Blue Heron case for my Clinesmith. With my older aluminum JM style Clinesmith I've traveled 5 round trips across the Pacific with it as my carry on "Brief Case" as well as my small carry on suit case..... Never an issue with any airline. American AL, Eva AL, Southwest AL and Alaska AL. It fits well in the overhead and no damage has ever occurred with it or the steel inside. That case is very well padded and very well made and the pocket is perfect for picks, bar and strings. It still looks new after almost two years. 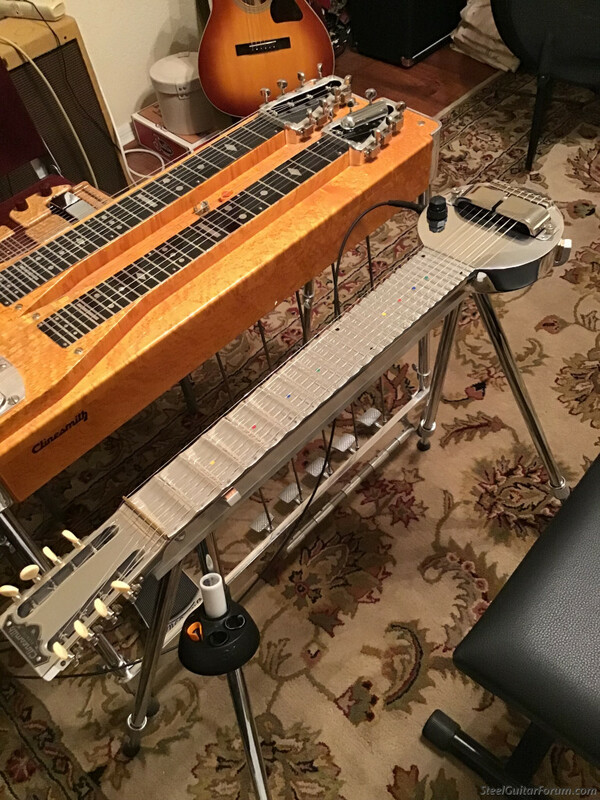 As for the steel guitars Todd builds, they are the best I ever had in those styles. I've got 5 Pedal steels and 5 lap steels as well as the T-8 console. 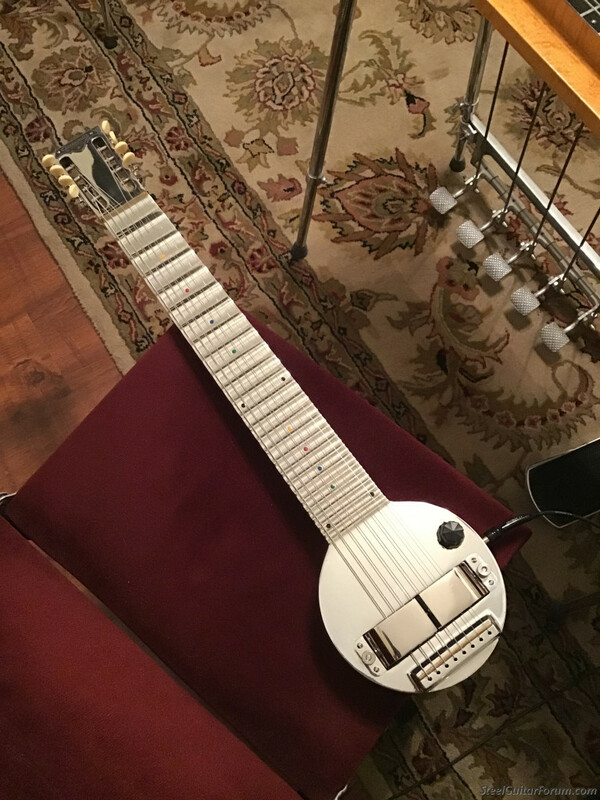 The Clinesmith lap steel (and his 7/8" bar)is without any doubt my go to guitar. Almost never a day I don't play it and I can't say that for any of the others. As much as I like them all, it's the best in tone and string spacing I ever had. You're killing me, Rick! I have one on order, too. Can't wait to take possession of it. Enjoy. And I’m still loving mine! A quick email to Mark Roeder and 3 days later, custom fitted Frypan brackets for my Deluxe34 U4 were at my door. I love these guitars. I have a few developments regarding the pickup coming up soon. 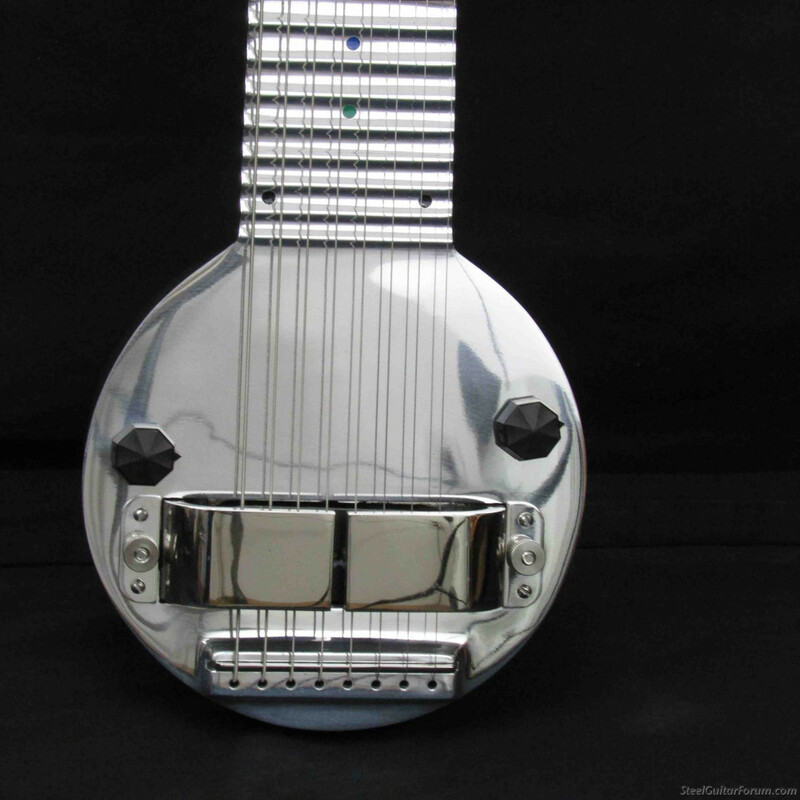 Also, I will be getting back on the 6 string long scale Frypan pattern as soon as my back log slows down a bit. I am shipping off 4 more tomorrow, and assembling another 3 this week including Hideki's. Here is a photo of the batch of 5 Ricks was in. And a close up of a frypan with separate tone and volume controls. The inside pot/knob is about the same height as the strings, and is close to the pickup so it does not get in way of the right hand . Hi Todd, These are beautiful! I don't see them on your website. Wow! Dots at 3 and 15! Joe, I am not offering them on my web site the for the time being. I've advertised them here and on my facebook page, which I usually contribute to just a few times a year. Jim, Yes I started offering dots at the 3rd and 15th after a few requested it. I need to add them to mine, as I am used to 3rd and 15th fret markers. If you would like me to add them to yours , we can do that. Just gorgeous! 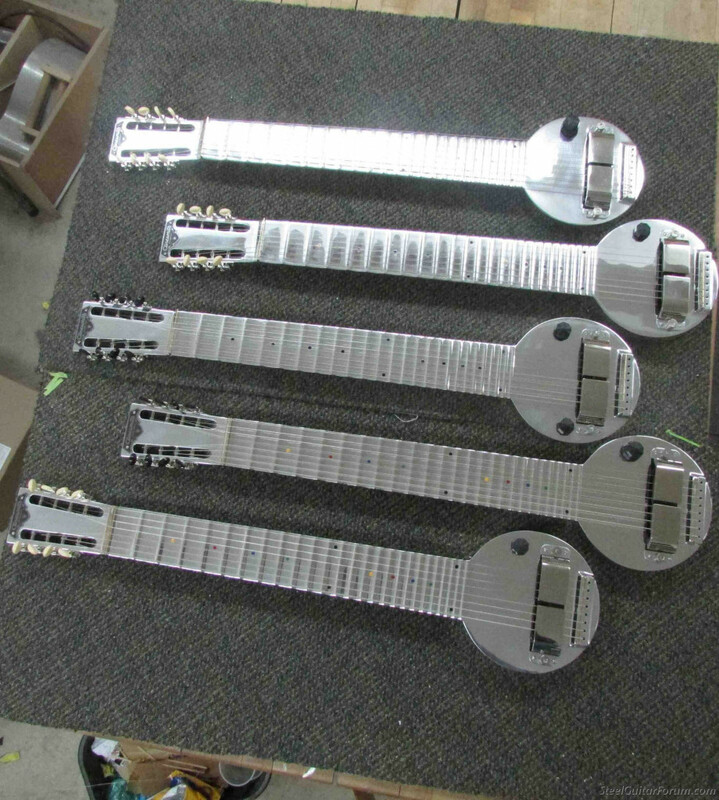 I have one of the 8-string Joaquin-style aluminum guitars on order but these make me wonder. How do you find the frypan's scooped-fret visibility versus the guitars with the high-contrast aluminum/black combination? Todd, what differences in tone are there for the horseshoes on the frypan versus the other aluminum models? Thanks! The Cast Aluminum Clinesmith (CAC) with the contrast black fretboard is easier to navigate on. 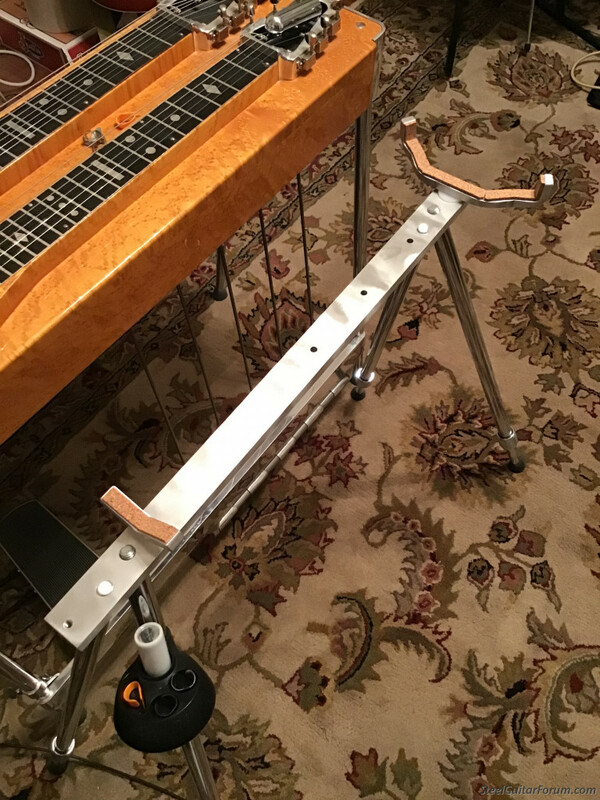 I think the same would go with any bright metal fretboard such as a frypan, or the real early Fender lap steels that had the bright nickel fret boards with black lines, under certain stage lighting . I have only put one of my newer horseshoes on one Cast Aluminum model. I have a short scale on the bench right now that is getting outfitted with my newer horseshoe pickup. I will make a recording or better yet a video comparing the two. Possibly with out making it too confusing I will compare the CAC model with the Clinesmith/Bigsby blade as well. I should add that I am also making a short scale 8 string Frypan pattern along side 6 string long scale. How do you find the frypan's scooped-fret visibility versus the guitars with the high-contrast aluminum/black combination? It didn’t take me very long to adjust visually to the relatively shiney scalloped fret markers on my Frypan. For me, the scalloped shape of the fretboard makes it much easier to see vs. the level mirrored surface of the Fender FS52 for example. I sold my budget Fender years ago, for that very reason. The dots at the 3rd and 15th are really helpful, too. I've found that under the horrible stage side lights we use at our regular bar gig, the shiny metal scalloped frets can be challenging, but I don't "fret" about it too much. Every design has it's pros/cons and for me, the pros are so big, I'll deal with getting used to the visual challenge. Todd, I may send it back for a couple of them sweet yellow dots. I do love this thing. Really helpful feedback. Thanks, guys! Those are lovely looking guitars. Could you tell me where you sourced those knobs please? I'd love to get a couple of those myself. Thank you Jeff. I make the knobs in house. They take a bit to make, but I could make you a few for a small fee.